I got my new Serena & Lily catalog on Tuesday. If you follow my blog, you probably know by now how much I love catalogs! Serena & Lily is one of my favorites. I love decorating for children. And I love Serena & Lily because it timeless and sophisticated, not cartoonish, not too childish. I have often wished that they offered a line tailored to adults. The Hubby is 6'3". On any given night we have at least one, if not two kiddos that climb into bed with us. We must have a king size bed. A king bed has been a decorating dilemma for me from day one. So you can imagine my glee when I found out that Serena & Lily now offers an adult-sized line of bedding...and it even comes in King and California King! WAHOO! 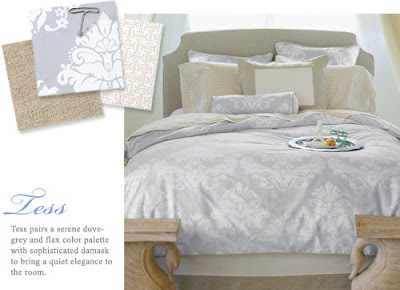 Look at the headboard...and the subtle damask print. Just what the doctor ordered. Bliss. I am so looking for some new bedding. I am on my way to their website. Thanks for sharing. That looks gorgeous!! I LOVE your new background and header!!! I love your new look BTW. I sure enjoyed catching up on your Site today. Lots of beauty and fun ideas. Your rooster tassel is to die for...very impressive! I got to visit the Boston area in Fall of 2003 at it's peek and I will never forget it. Thanks for the beautiful photos. I saw this in my Serena and Lily catalogue just yesterday and thought that it would make the perfect grown-up room bedding. Gorgeous. Yay for Serena and Lily...too bad were in an economic crisis and I can't just go shopping! I am loving the new layout...very classy. It sounds like you have more diet coke at your house than I do at mine,...I am on my way over. Beautiful! I love that comforter!! I love your new header!!! that bedding is beautiful! i will have to go and check this company out. I have never even heard of them. I know, I live under a rock. Your little family frame that you made is darling. What a great idea for christmas gifts! Wow, great tip! I would love to have a new duvet for my bed too...I will check it out! Thanks Wendy! Your blog's new look is beautiful! I have never heard of this company before. I'll have to check them out. i could curl up into the bed and sleep forever! Ooooh! I'll have to get me one of those catalogs! I love "window shopping"! So much fun...love the classic look of that room!